(Denver, Colorado; Orlando, Florida) - HREC Investment Advisors has just completed a study of hotel supply and demand trends in the Orlando Market (as defined by Smith Travel Research) over the current economic cycle. The study includes a forecast of guestroom additions for CY2018 and projections for CY2019. • Visitation Growth (Current Cycle): From 2010 (when the current cycle began) through 2017, visitations to Orlando have grown from 50 million to 72 million, an average growth rate of 6.3% per year. • Hotel Supply Growth (Current Cycle): Over the same seven-year period, supply growth has averaged less than 1% per year. 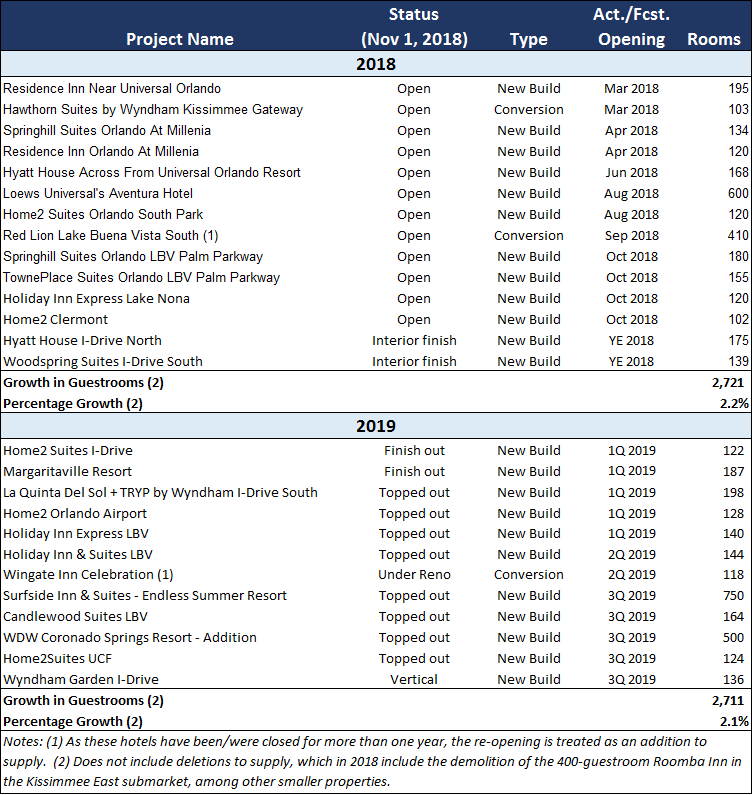 Over the past five years (from mid-year 2013 to mid-year 2018) – i.e., during that time in the cycle that hotel development started accelerating – supply growth in the Orlando Market averaged just 1.2% per year. • Visitation Growth (2018): Although mid-year visitation counts are not regularly published for the Orlando Market, they are for the State of Florida. Given that Orlando is the largest market in the state (typically it accounts for at least 60% of the overall Florida market), mid-year estimates for the state are a good indicator of Orlando-specific trends. To this point, Visit Florida has estimated that visitations to Florida grew by 5.9% for the first six-months of 2018. By extension, it is safe to assume that visitation growth for Orlando in 2018 will continue to grow at a rate of 5% - 6%, which will result in the eight-consecutive year of record visitations. • Hotel Supply Growth (2018): Based on a count of those hotels that have already opened or are scheduled to open by yearend, Orlando hotel supply growth for 2018 is forecasted at 2,739 guestrooms, a growth rate of 2.2%. See the table below for a listing of these hotel projects. To put this in national perspective, CBRE Hotels America Research projections for CY 2018 for the top 60 metropolitan areas in the USA showed that the Orlando market ranks 47th in terms of percentage growth. • National Economic Growth -- With the overall economy at full-employment and continuing to grow at above historical averages, each year more people throughout the country find themselves with enough disposable income for an Orlando vacation. • New Attractions – Not surprisingly, historically there has been a direct positive effect on visitations from the opening of new (major-theme park) amusements. To this point, Disney’s Star Wars Land -- which will be the biggest opening of an attraction in Orlando since the initial Harry Potter amusement came to market at Universal in 2010 – is scheduled to open in the fall of 2019. After what should be another year of positive visitation growth (based on the overall economic outlook), the opening of Star Wars Land will likely catapult visitations during the last quarter of the year (typically a period of lower hotel occupancies) to push the market to a ninth-consecutive year of record visitations. If there is a surprise to visitation trends, it will likely be to the upside. • Hotel Supply Growth (2019): At this time of year (early November), one can predict the growth in supply for the following year with some precision: if a hotel is not under construction at this point, it is not likely going to open next year. Based on this assumption, HREC personnel physically toured each of the proposed hotel project sites in the market and, as such, have concluded that in 2019 hotel supply will grow by some 2,711 rooms (+/-2.1%). See the table below for those properties that are expected to open in 2019. Added Sexton: “Based on (1) the seemingly never-ending addition of flagship attractions at both Disney and Universal, (2) on the ever expanding and improving Orange County Convention Center and (3) on local officials’ commitment to expanding the travel bandwidth vis-à-vis major airport and roadway expansion projects, demand should continue to grow at rates that exceed those for the national economy. HREC is the nation’s leading lodging and gaming real estate advisory firm specializing in property sales, mortgage brokerage, equity/JV structuring, consulting including market studies, and litigation support. With 18 offices throughout North America, HREC® is distinguished by unwavering commitment to client service and success through its team approach, intellectual capital and hotel/casino specialization. HREC Releases Study "Orlando Area Hotel Transactions - Year in Review (2014)"